Read-out Instrumentation Signpost: Major International Water & Wastewater event! 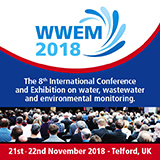 The organisers of WWEM 2018, the water, wastewater & environmental monitoring event, have now published details of a comprehensive programme of conferences, seminars and workshops that will take place during the 2-day (21+22 Nov 2018) event in Telford (GB). Covering testing issues such as microplastics, nutrients and pesticides, the event will cover all of the most topical subjects in water and wastewater analysis and monitoring. Many of these presentations are free to attend; as is the international exhibition that accompanies them. Registration is now open and all pre-registered visitors will benefit from free parking, refreshments and lunch, in addition to free entry to AQE 2018, the co-located air quality and emissions event. Both events include a major international Exhibition offering access to the latest technologies from the world’s leading brands. In total there will be over 150 exhibition stands representing over 300 world-leading organisations. These Conferences are CPD certified and with such a large selection of Conferences, Workshops, Seminars and a major international Exhibition, visitors are advised to register early at WWEM 2018, and to plan their trip in advance.